A fiftieth birthday card for someone who loves bunnies. 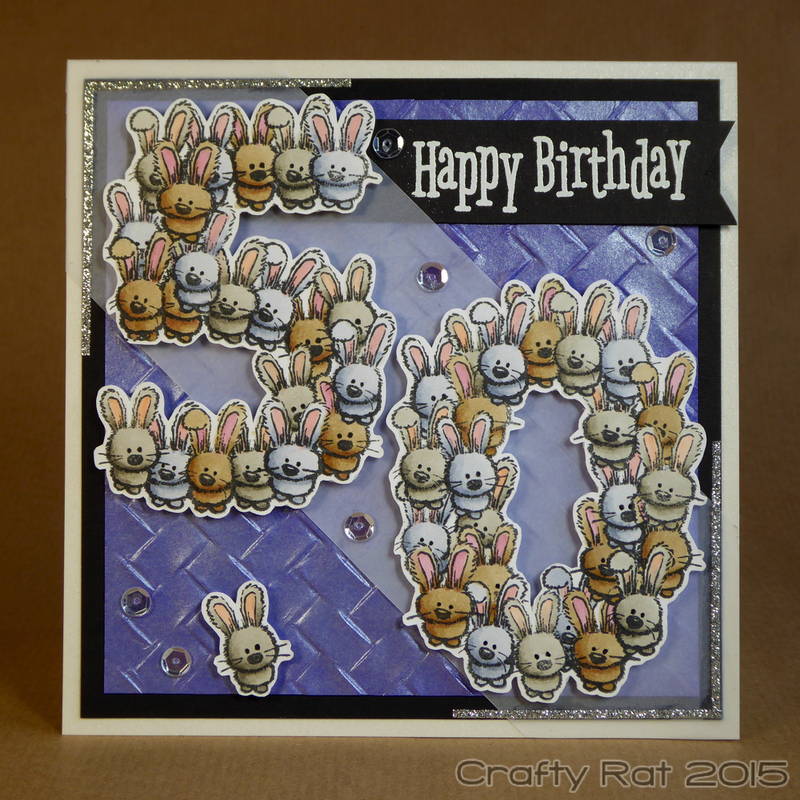 What better to do than make a card with fifty bunnies on it in the shape of the numbers five and zero. That thought process was quickly followed by the sensible part of my brain thinking that one large bunny holding a sign saying “50” was a lot more practical; however, the idea was there and the challenge was taken up. It took a while; this is how you do it. First open up your graphics program, create a canvas the same size as your finished card, and find a font that has nice clean bold numbers. Type “50” and size it appropriately. Now scan in the tiny bunny images and bring them into your card image, making sure the sizes and resolutions match. Make lots of copies of the bunnies — fifty in total — and spend far too much time arranging them over the numbers. Once you’re happy with the result, print it out. This is your stamping guide. Note: you could just wing it and stamp the bunnies over the “50” without planning it out, but I wanted to get as close to fifty bunnies as possible and this seemed like the best way to achieve that. I did simplify it a little by only using one of the three bunny images when planning the layout. Also print out the “50” and trace this lightly onto your card as a guideline for stamping the bunnies. Lots of these bunnies overlap, so you’ll need some masks. 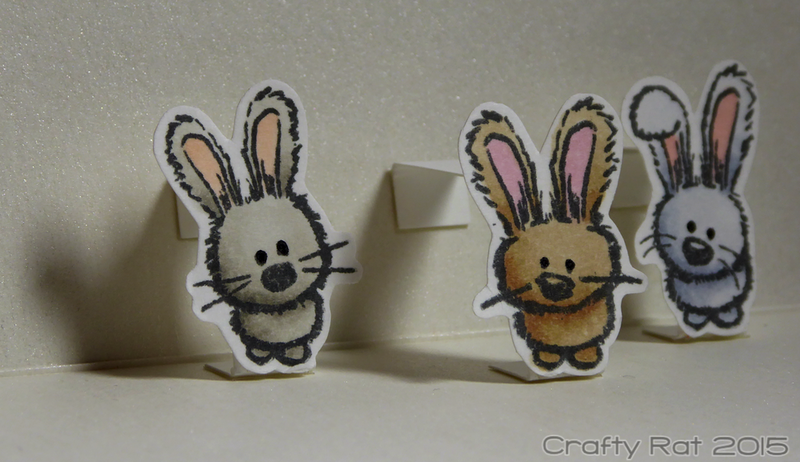 Stamp your bunnies on masking paper and fussy cut them out. I did two of each. Referring to your guide, masking as needed, stamp bunnies all over the numbers. If only it took as little time to do as to say. Erase the pencilled “50”. Now you can colour the bunnies. I chose to do them in three different colour combinations. It’s at this point that you realise that you got a few stray spots of ink on your previously pristine background and come to the conclusion that you’re just going to have to fussy cut the numbers out. And at this point you realise that you really hadn’t planned any further than this point and you have no real idea what you’re going to do with these carefully created numbers. You spend more time than you care to remember playing around with different coloured papers. Finally you decide to have a layer of faux textured metal, but of course the pieces you have in your stash are the wrong size so you make a new piece from scratch (though this does give you the opportunity to try out the new WRMK next level embossing folder). On the second attempt you stamp and heat emboss the sentiment on a piece of card that is actually long enough to slide all the way under the vellum. After much trimming and gluing you end up with a pearlised card base layered with a black mat, a textured panel, the embossed sentiment, a diagonal strip of vellum, and the foam mounted numbers. Oh yes, I forgot to mention that, because this has to survive going through the post, you decide to roughly fussy cut some fun foam to mount the numbers. You add some glitter strip to finish off the corners where the vellum was attached and some sequins because… sequins. Then you remember about the other four bunnies, mount one on the outside and create simple pop-ups with the other three inside. Finally it’s done. Except you realise that you don’t have an envelope the right size and have to go and make one to match.